Received mine today. Goes great with my tweed jacket and adventure shirt. Date Added: Wednesday 29 July, 2015 by Curtis M.
I probably own 50 or 60 new, vintage, and just plain used bow ties, and this is the best quality bowtie I own. I is a sturdy, ridged blend of wool and silk that stays true to form and doesn't get the droop factor when running from Nazis or chasing seagulls on a beach. It is both the perfect addition to my Dr. Jones Sr. tweed costume and a fine tie I can wear with most of my suits due to the earth tones that work with my wardrobe. Plus, Magnoli gave me free stuff with it! Service and quality doesn't get better than this!.. Date Added: Monday 19 May, 2014 by Derek D.
Very nice self-tie bow tie in a pleasantly subdued pattern. The construction and fabric are first class. Great for fans of Doctor Jones or lovers of vintage clothing.. This is a quality tie. I own many bow ties but all are bright and dressy. This, while being of excellent construction, is more casual. My style is blazers and khakis and this tie works perfectly. It can be dressy if needed, but does casual just as well. Highly recommended!.. 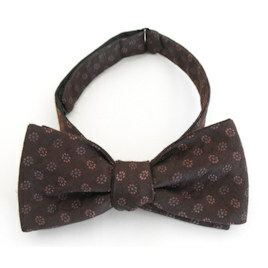 Date Added: Monday 03 May, 2010 by Christian G.
Extremely high quality bowtie. Completes my professor look in a way that just wouldn't be possible without this correct pattern. Thanks!!.. Date Added: Saturday 03 April, 2010 by Stella C.
It was an absolute joy to receive this tie! Gorgeous material and attention to detail! Great work!